Sorry for being late on my post. I had family come into town and lost track of time. 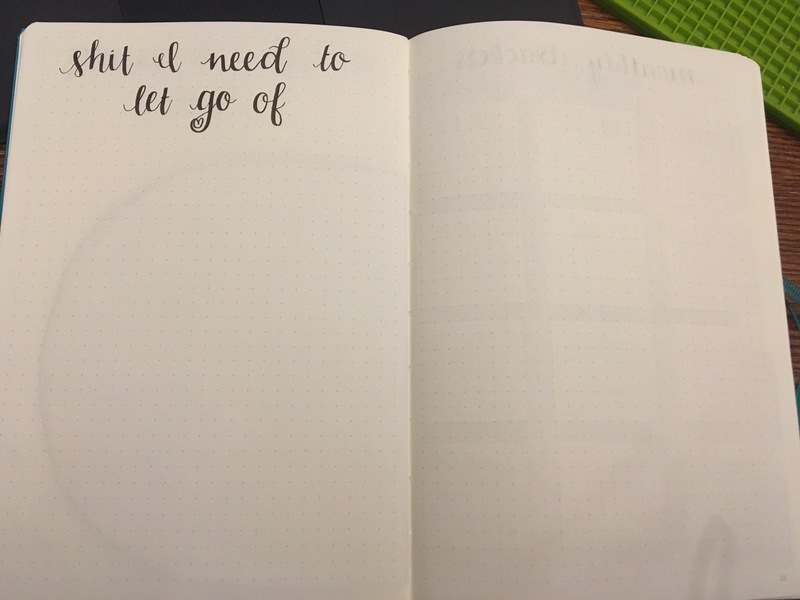 I would like to take you on a walk-through of my new bullet journal. I had no clue that it would be such an undertaking and I severely misjudged the amount of time I needed. I am still working on the initial set up and am having to start working in my dailies as I go. Note: I used a lot of my new sticker designs, but remember that they are all available in the Printable Tools and Freebies library. Just sign up for my email list or email planetplanit@outlook.com to be added to the bi-weekly email list that will include the monthly access code. I promise I will make it worth your while and won’t overload your inbox. 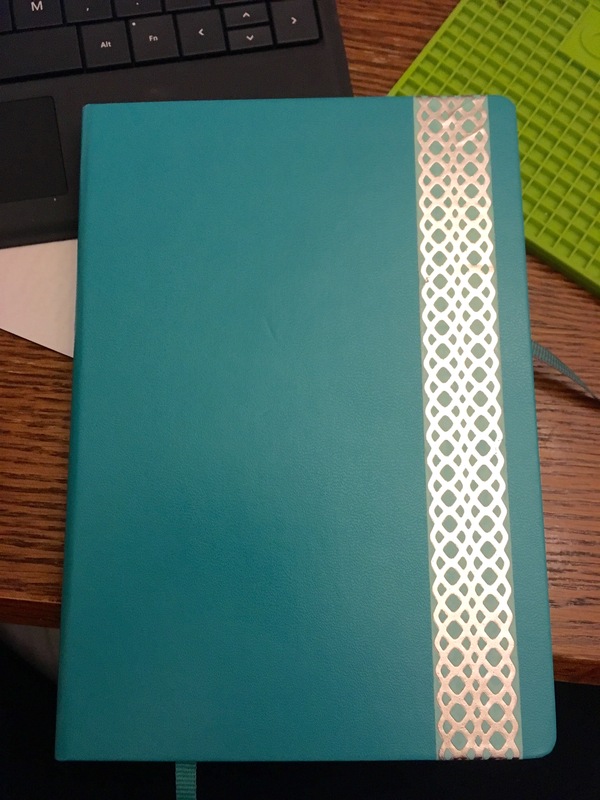 I am using the Leuchtturm 1917 A5 Dotted notebook in Emerald. I bought it at a local store here in Seattle, but the link goes to the Amazon listing – the price can fluctuate, but here is another one that is a little cheaper. I always fill in my contact info in case I lose my journal. Here is my first sticker. 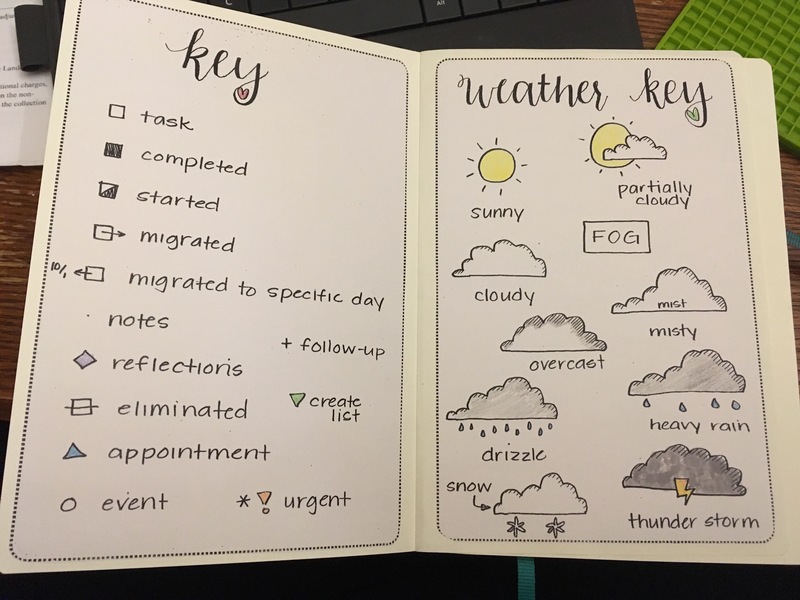 I decided to make my regular key and weather key into stickers because then I can print and stick them in each notebook that I use. Here me out… my last bullet journal showed me that I have so much crammed between the covers that there was not enough index to catalog the whole thing. So, I had two options: (A) stop cataloging everything or (B) add another index page. I chose option B. This sticker has two index pages per sheet and I am very happy with it. 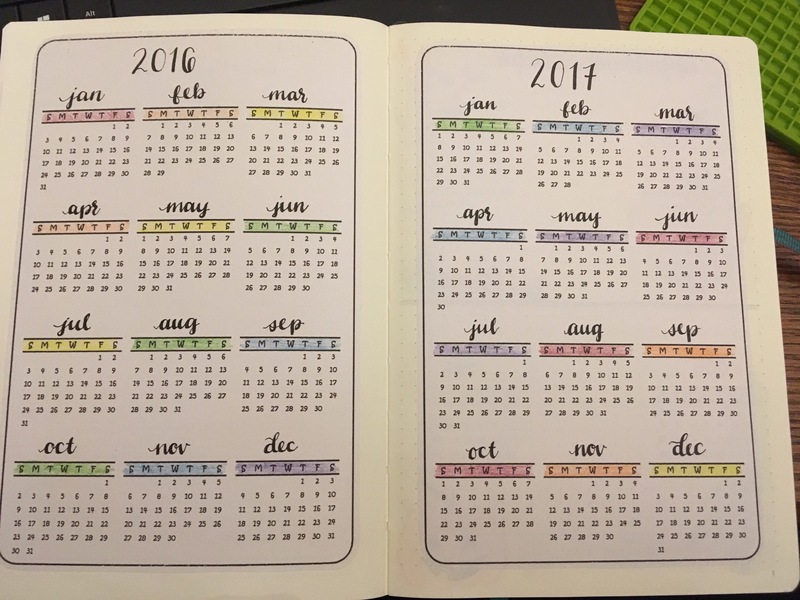 In my last bullet journal, I included an year calendar and I used it all the time. I kept the idea and added the next year as well. My library has tons of calendars: bordered, printed month labels, handwritten month labels, abbreviated month labels and more! 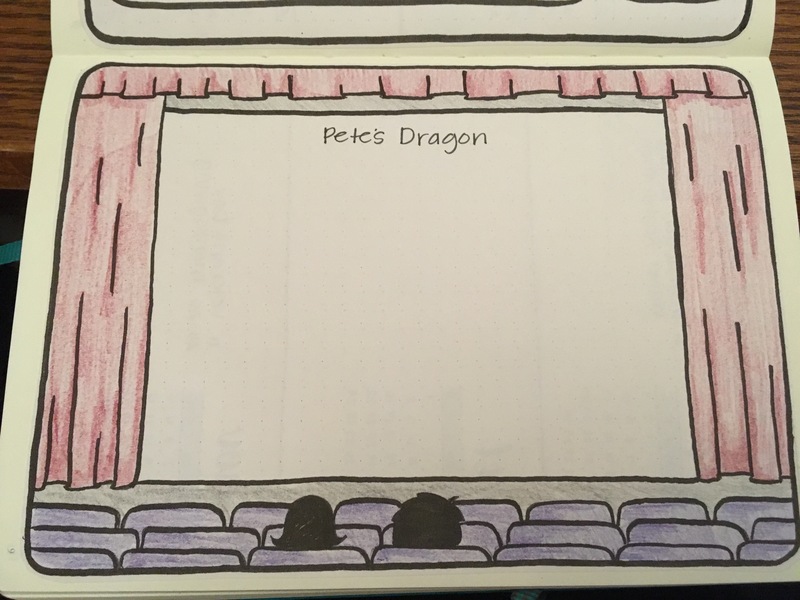 The next six pages are my important dates. I decided to give myself more room and only put 2 months per page, making this a six-page calendar, but that is ok! 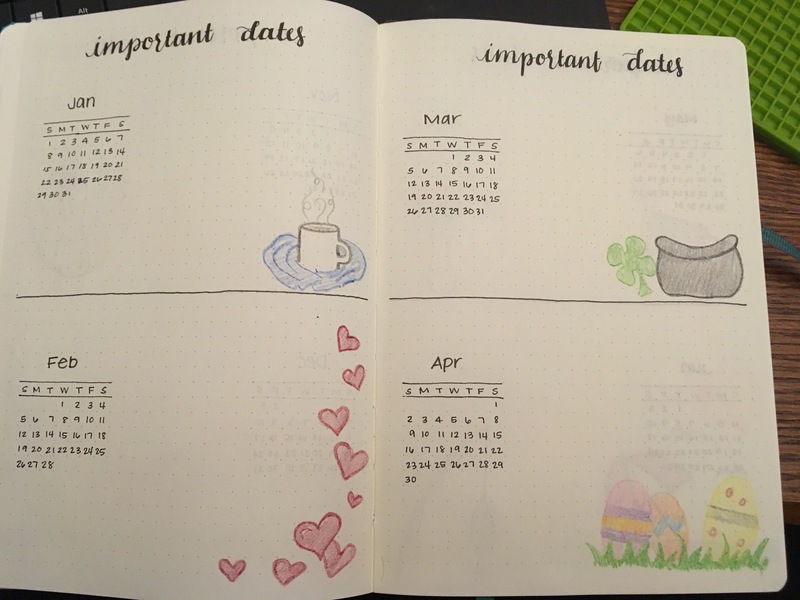 I also like color on each page so I decorated each month with a coordinated little illustration. I love these next two pages. They are my television shows to watch and my movies to watch. I made them fun and I am writing the movie titles centered so they look like credits. I am attending the first quarter of my HIIM program so I included a spread of important school dates and there is space for class info once I am all registered. My No Spend Wishlist is my page to acknowledge all my wants when I am adhering to my budget. I right it down, feel better, and buy it when I am able to. 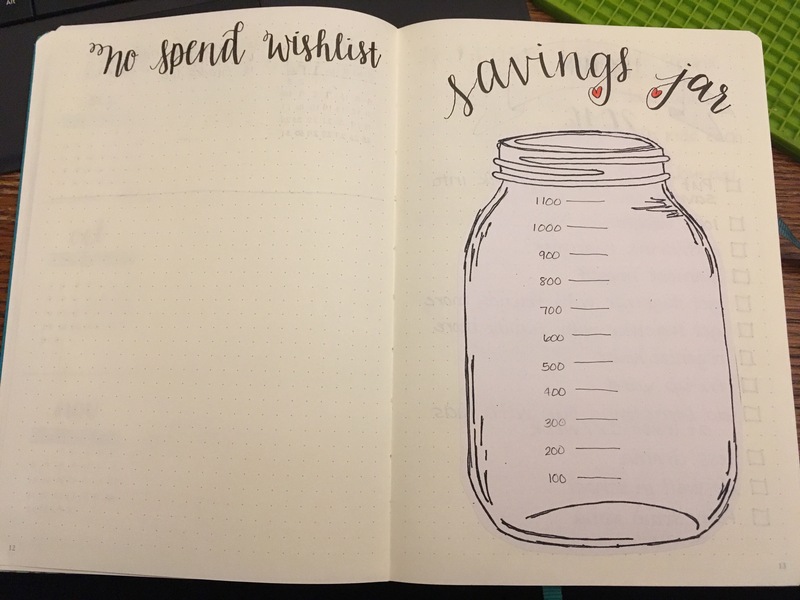 The savings jar (another sticker!) is my visual savings tracker. My jar will fill up slowly as I put money away. 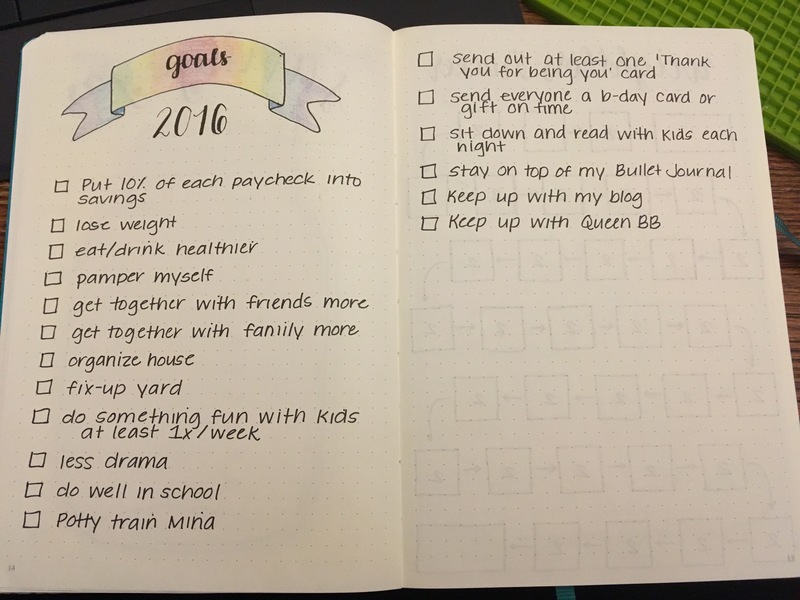 I have goals… don’t we all? 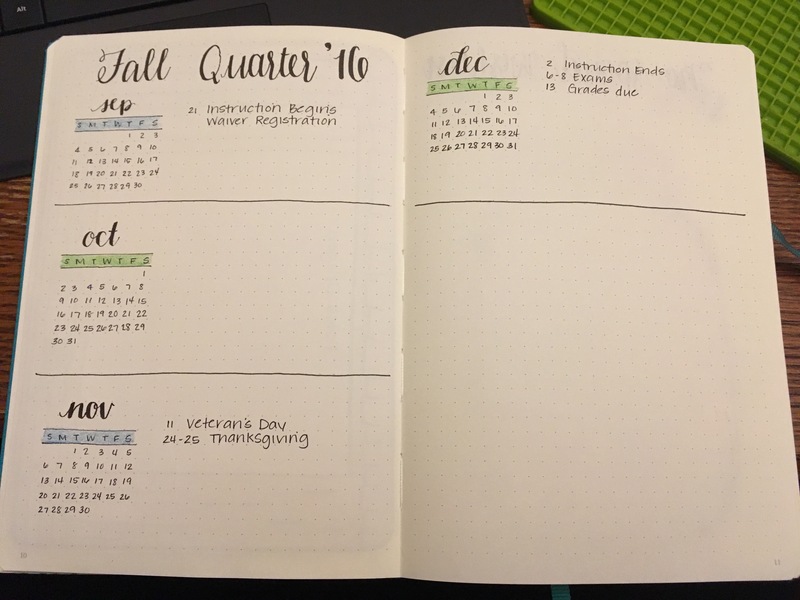 This spread is my running list. 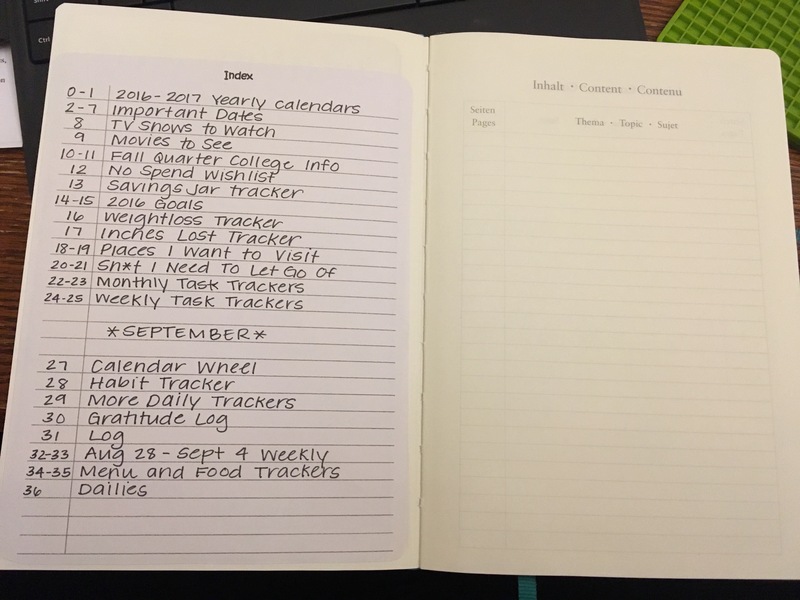 Each item has a checkbox next to it where I will mark it completed at the end of the year or at the end of this bullet journal if I accomplished the task. 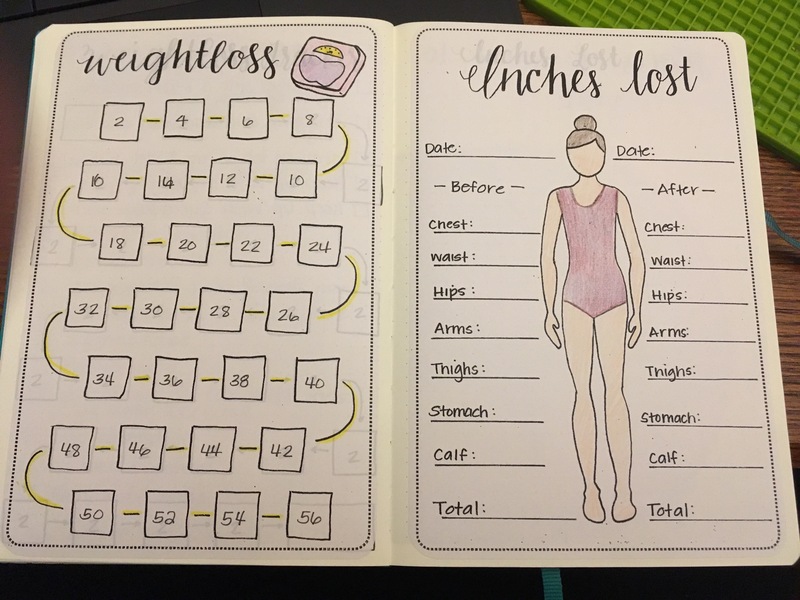 I am jumping back into my fitness routine and reserved a spread to track my pounds lost and my inches lost. Both are stickers that are relatively blank and can be colored in or filled in to personalize them to your taste. This is a new sticker that I added. 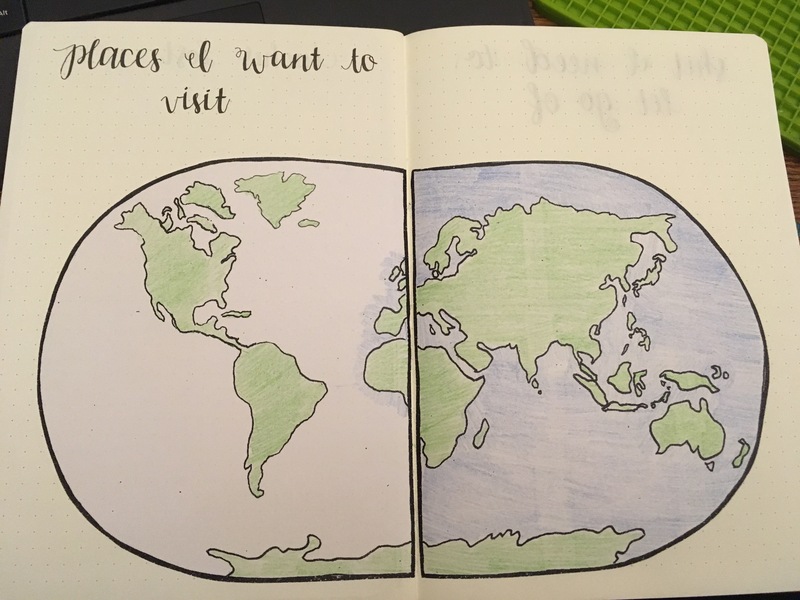 I decided I wanted a way to track places I want to go. The sticker is divided to lay across two pages. I am not done with mine, but it will be fun when it is finished. I plan on placing labelled dots where I want to go. 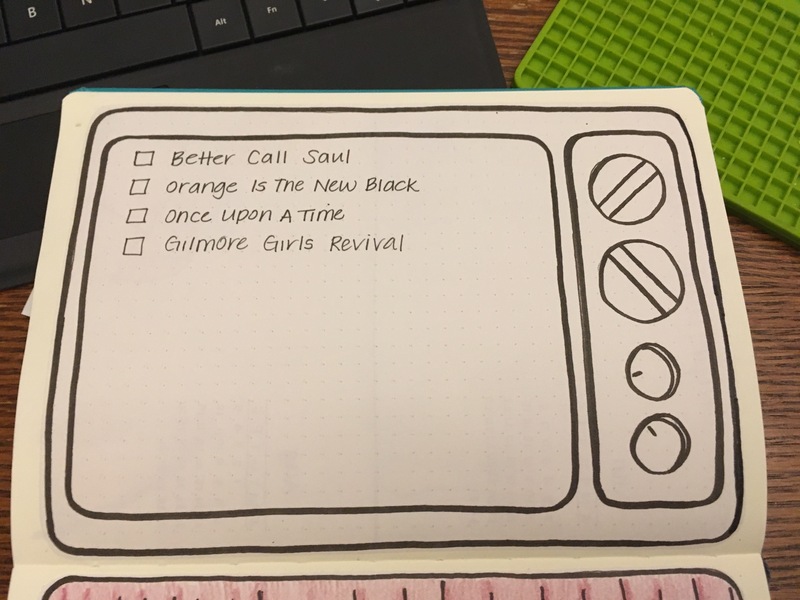 I had this page in my old bujo and moved it to the new one. It is my rant page. I write things down that bother me and promise myself to stop dwelling on them… it works for me. 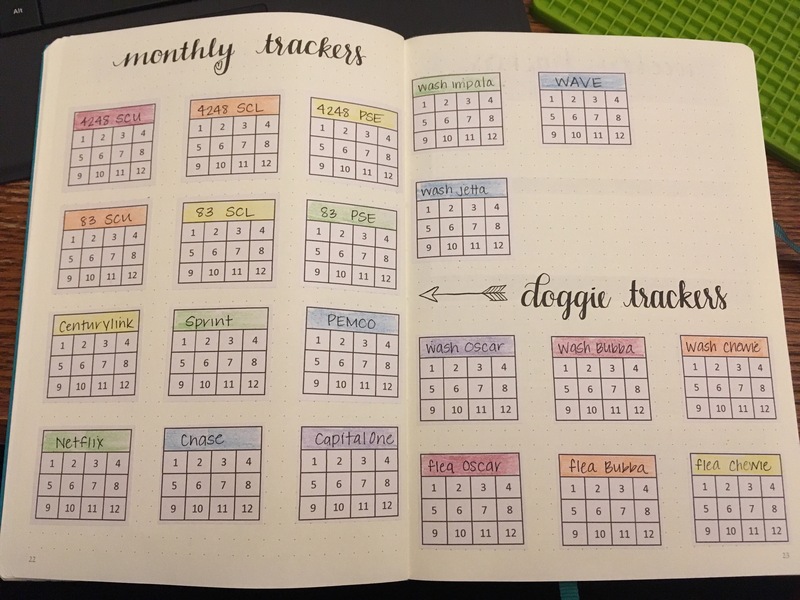 Here is my monthly task tracker spread. I track things like bills and my dogs’ flea medication here. 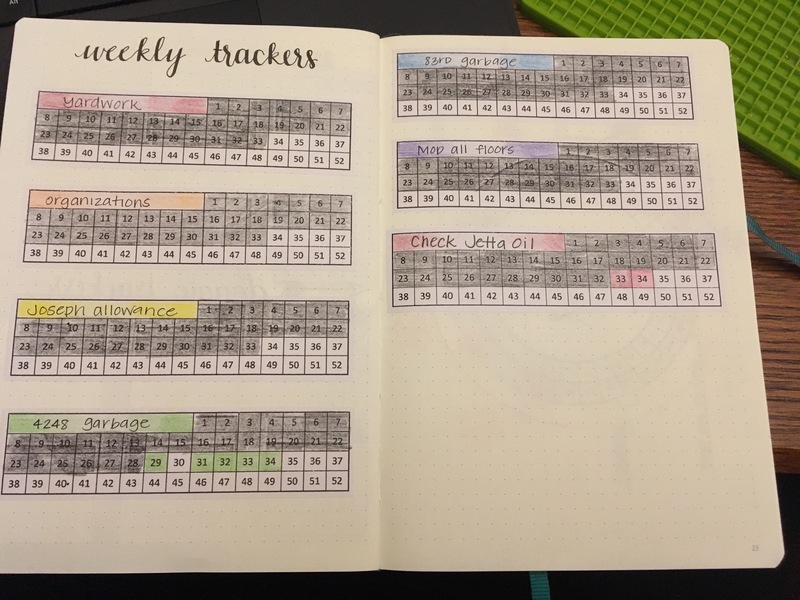 I use these weekly task trackers for things like kids’ allowance, garbage, and checking the oil in my older car. 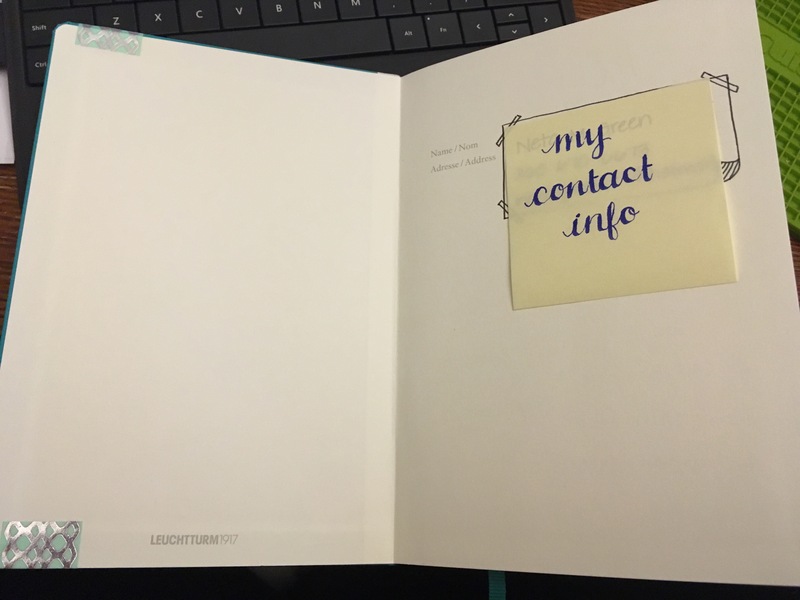 My Leuchtturm has almost 250 pages in it. One thing that bothered me in my old bujo is how my lists and collections were strewn throughout my notebook. Therefore, I took page 200-201 and labelled it ‘Collections, Lists, & More’ and the right page got another index sticker. All my lists will be created and cataloged in the pages after this. That is it. 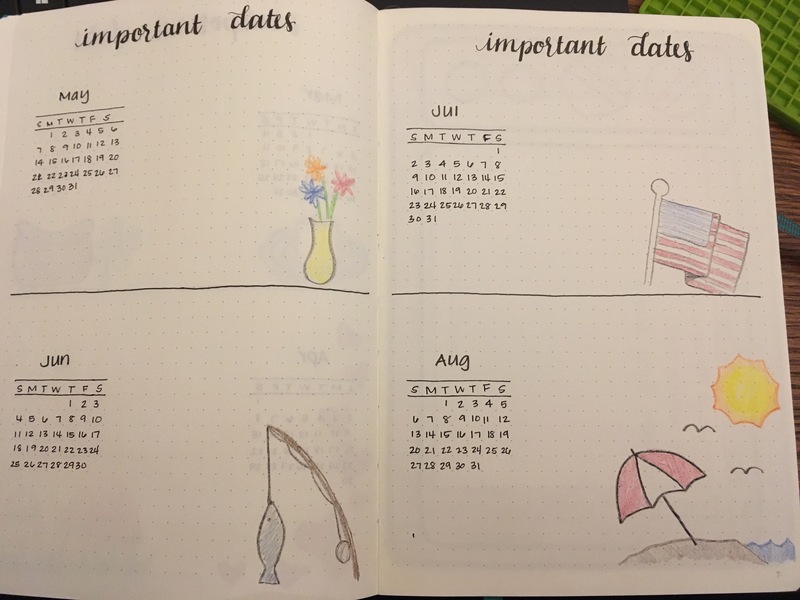 After that is the start of my monthly, weekly, and daily pages. Your ideas are wonderful. I sent an email, to follow you. 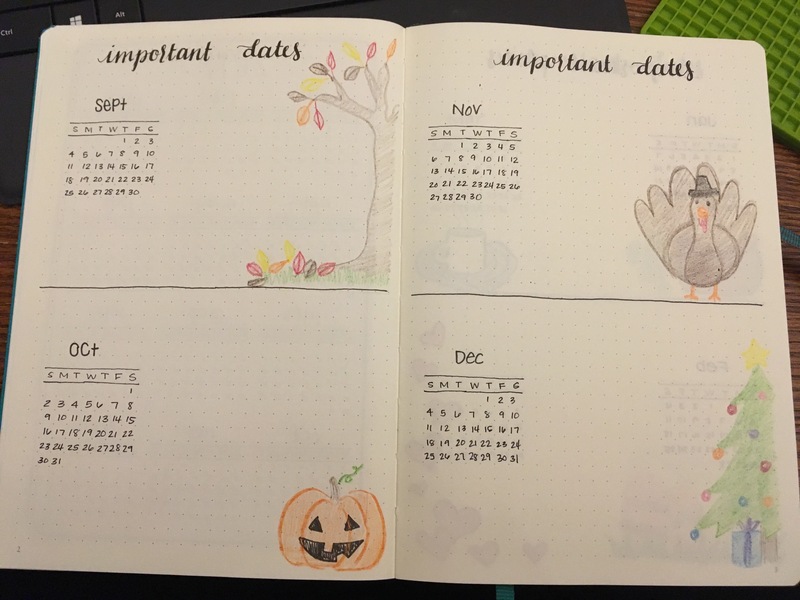 I am just starting to revamp my planners. thanks for this awesome sharing, i just sent an email, hope you can reply me, thanks!! I will get right on my emails and will respond to you shortly! Thank you, Amanda! You should have received your ‘Welcome’ email with access code. I hope you enjoy the printable library! Pingback: 2017 Binder | 1 – Thoughts From Sarah J. Where can I find the image for the weightloss measurements? I would like to add that to my weightloss journal! Thanks! The pdf printable is located in the library. It requires an access code as only Planet Plan It blog followers have access to the free printables. If you are interested, email planetplanit@outlook.com Once you have access, there is a section called ‘Fitness’. The weight lost and inches lost pdf lives there.